Pivotfarm.com is a provider of Technical Analysis data sheets for traders of various markets. Our data considers some of the most widely followed methodologies including Market Profile, Fibonacci, Volume Analysis, Calculated Pivots and most importantly price based Support and Resistance (S&R). We have combined all these methodologies in a confluence matrix. This allows the trader to determine the strength and importance of an S&R level; based upon the levels other market participants using differing calculation methods (Market Profile, Fibonacci etc) are watching. The Trading sheets are updated daily, many hours before the open of the trading session. 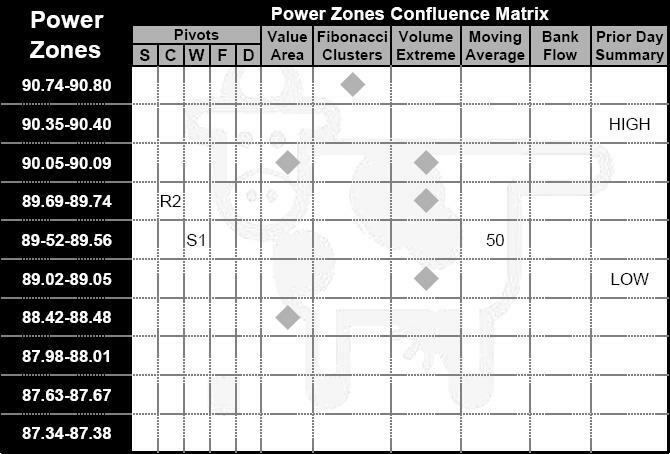 The black strip of price based PowerZones are the key data described in these data sheets, they are based upon analysis of swing lows across multiple time frames and volume based analysis. The sheet is structured around a central ‘PowerZones Confluence Matrix’ encircled by multiple peripheral data tables which feed into the central table. The peripheral tables help traders to add probability to potential price based PowerZones. Importantly all peripheral data sources such as Fibonacci Clusters, Volume Extremes etc, can be used completely independently of the main table. The information in this sheet is to be used solely as a guide, varying market conditions, news and volatility must be gauged by the individual trader. The ‘Initial Balance’ is commonly used in Market Profile and simply describes the high and low of the first hour of trading. The data described is from the previous trading day. The ‘TPO/Vol. Value Areas’ data is derived from Market Profile; the data described is created from the profile of the previous day’s price action. It defines the value area i.e. the area in which price spent 70% of its Time (TPO) OR Volume, the high of this 70% range being the VAH and the low being the VAL. Importantly the POC as described, is the price point that was most heavily traded and offers a key point of reference for trading. Described in the sheets are 1day, 5day and 20day Volume/TPO Value areas. The ‘Naked VPOCs’ is data created from the Volume based POC (Point of Control) of previous trading days; it is related to the ‘Volume Extremes’ data, in that it is volume extreme based, however it is based upon individual trading days, rather than cumulative volume data. The POC is the price at which the highest amount of volume was traded that day, Naked POCs are POCs that price hasn’t retested since their formation, thus offering an increased possibility of being ‘filled’ in future price movements. 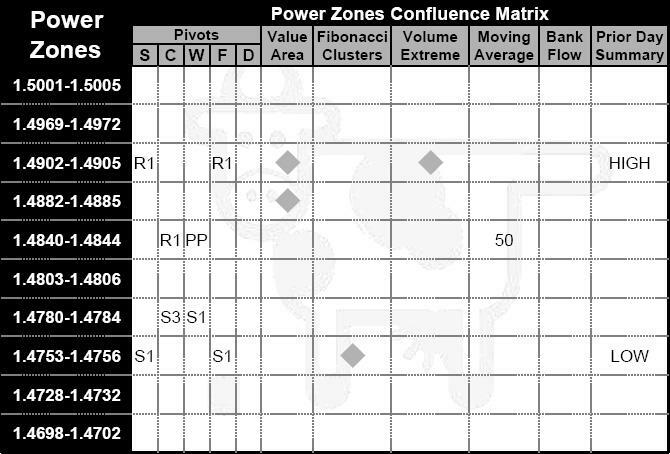 The ‘PowerZones Confluences Matrix’ is the single most important element of the Pivotfarm data sheet, the levels described on the left hand side of the table are defined by price and offer high probability areas for price reversal. The rest of the information is derived from the peripheral tables that surround the central table. They offer confirmation and confluence of the PowerZones levels and help users to determine when other market participants using that particular piece of information may be entering the market. The ‘Pivot Points’ data is widely used with various calculation methods, including Camarilla, Woodie and DeMark. These are calculations based upon the open, high, low and close of the previous day and provide mathematically derived Support/Resistance levels. The ‘Prior Day Summary’ data very simply describes the Open, High, Low, Close and Range of the previous trading session and also the range of the trading day. The ‘iMap’ describes the directional bias of a set of indicators based on the daily chart. Red denotes Sell side bias, Blue a Neutral side bias and Green a Buy side bias. The ‘Fibonacci Clusters’ data is derived from Fibonacci retracement levels across multiple higher level timeframes (4hr and above), the information from these timeframes is then combined and areas that have multiple Fibonacci levels ‘clustering’ together are described in the table. The ‘VWAP’ data describes the ratio of the value traded to the total volume traded over a particular time horizon (usually one day). It is a measure of the average price an instrument traded at over that timescale. The sheets describe the VWAP at close of trading. The ‘Daily Moving Averages’ data describes the relative positions of the 10, 20, 50, 100 and 200 day simple and exponential moving averages. These daily MAs are amongst the most widely watched in the market and based upon 24hr data. The ‘Volume Extremes’ data is based upon long-term cumulative volume against price, the most noticeable volume peaks and valleys ar e described in the table. These are areas that are highly likely to be Support/Resistance as price is often drawn to these levels due to the extreme amounts of volume traded there over time.